Phoenix, AZ - Focusing on building and training the Republican “farm team,” former Maryland Lt. 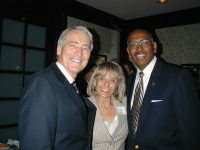 Governor and Chairman of GOPAC, Michael Steele, was in town yesterday to lend his support to Arizona Republican Party Chairman Randy Pullen and help the party raise over $25,000 at a fundraising reception at Donovan’s of Phoenix. “We must recommit to building our base and undertake the responsibility to recruit, field and train Republicans at the local level, so that down the road we have qualified candidates ready and waiting to run for office on the statewide or federal level,” said Steele. GOPAC was originally founded in 1978 by Pete Du Pont as a vehicle to elect Republicans to state and local office. Newt Gingrich later took the helm of the organization and laid the groundwork for the eventual Republican takeover of Congress in 1994. Michael Steele took the reigns of the organization earlier this year.